Sandwell and West Birmingham Hospitals NHS Trust has invested £70,000 in futuristic-looking machines to tackle infections at City, Sandwell, and Rowley Regis hospitals. Resembling something that wouldn’t look out of place in Dr Who or Star Wars, the Sterinis robots emit a gas that helps the fight against infections such as norovirus, MRSA, and C.difficile, and are used to complement the deep clean process on wards. Steve Clarke, Deputy Director of Facilities, explained: “The machines produce a dry mist of hydrogen peroxide, which will eradicate pathogenic organisms from the environment, even from hidden or inaccessible areas. “They are used in conjunction with a deep clean following an outbreak or infection. Side rooms and wards are used inclusive of furniture and equipment, everything is left in place, and the area is sealed. 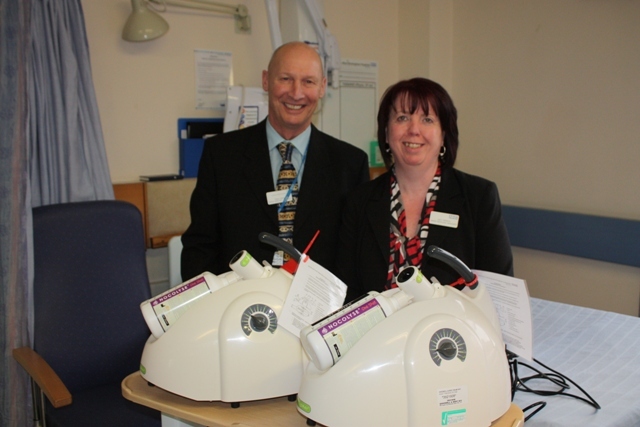 Sandwell and West Birmingham Hospitals NHS Trust began using an airborne disinfection system in 2008 as part of an initiative to help combat healthcare-associated infections and now 20 of the new-generation machines have been purchased for use at the three hospital sites. The Trust has been achieving high standards of cleanliness and the recent Patient Environment Action Team (PEAT) hospital score for overall cleanliness was rated as excellent.